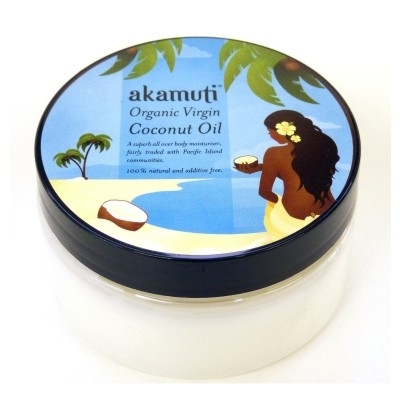 A superb all over body moisturiser, fairly traded with Pacific Island communities from "Akamuti"
This wonderful coconut oil from "Akamuti" smells absolutely gorgeous. 100% natural & cold pressed, it has a pure white colour & a fragrant coconut aroma. And it keeps getting better! As well as being totally free from bleaching agents (it has not been deodorised or fractionated) & retaining all its natural aroma & goodness - it is also fair trade! As a moisturiser, coconut oil absorbs very readily into the skin & keeps it soft, but not greasy. More of a coconut 'butter' at normal room temperature, it is softer than shea butter & melts quickly on the skin. If you kept it in a warm place (such as a sunny windowsill) it will melt into a light oil. It makes a perfect belly butter or massage oil. Coconut oil can be used as an excellent all over body moisturiser. It helps to reduce chronic skin dryness & aids the removal of the outer layer of dead skin cells, making the skin smoother. The small molecular structure of coconut oil allows for easy absorption through the skin, giving it a soft, smooth texture. While doing this the coconut oil strengthens & maintains skin health. Organic coconut oil is wonderful to use as a hair conditioner as it softens the hair and conditions the scalp. Using the coconut oil as a pre-wash conditioner can help combat dandruff. Coconut oil is famed for its ability to strengthen the structure of damaged, devitalized hair being an effective lubricator. It also softens the hair shaft through the action of minerals such as magnesium, potassium, calcium, and iron. The best way to apply the coconut oil is to massage the oil gently into the scalp & leave for up to half an hour before shampooing out. (You can leave on as long as you wish, but this will make it harder to shampoo out as it cools!!). Fair Trade Source This beautiful organic coconut oil is fairly traded with Indonesian island communities throughout the Pacific Ocean. All the oil comes from family farms only, where individual families work together to collect & process small amounts of coconuts on a daily basis. This special small scale system in place across the Pacific islands ensures that the oil is of the highest quality & is created within one hour of breaking open the nuts! The processing is also highly sustainable as there is absolutely no wastage whatsoever. Every part of the process is used in some form, from fuel to animal cake. An integral part of tropical island life, coconut production forms a pivotal role in the lives of coastal communities, of which many are now endangered. By purchasing this fair trade coconut oil we support not only the livelihoods of island communities, but their language & cultures, their forests & reefs. Bypassing conventional coconut production & the devastating effects of copra processing provides sustainable employment, a better standard of living & long term protection for fragile eco-systems & vulnerable communities. This breaks the cycle of oppression & poverty inflicted on hard working people. Coconut oil production is also helping to rebuild Solomon Island communities destroyed by the April 2007 Tsunami. Available in 50g size and 175g size.